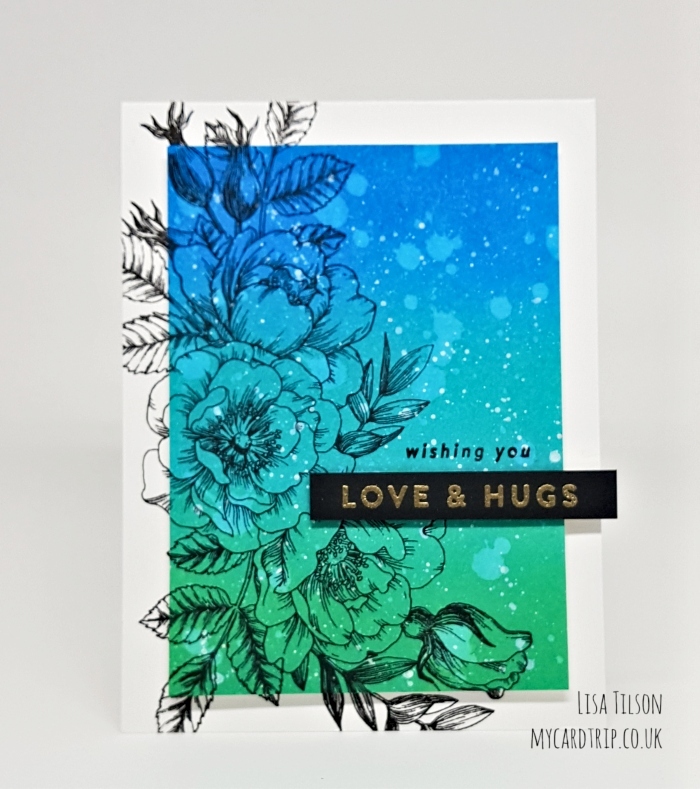 Today is World Cardmaking Day and so it would be extremely rude not to make a card today, and it has taken me all day as the phone kept ringing and there was all sorts of other things that needed doing! So, finally I have a card to share. I have been taking a class recently over at Online Card Classes called – An Introduction to Color Theory – the fabulous main instructor being Debby Hughes. I wanted to try and understand how colours work better together – I am mostly self taught in terms of colour, and generally just throw down what I think works but sometimes that means that I veer towards the same colours. This class teaches you about the colour wheel – what primary, secondary and tertiary colours are; how to use monochromatic colours, analogous colours, split complementary and split complementary colours – but I won’t go into too much detail right now! I wanted to experiment with analogous colours today – those that sit next to each other on the colour wheel. And this is the card that I came up with. By complete fluke I had distress inked a panel weeks ago using three Oxide colours – Lucky Clover, Peacock Feathers and Salty Ocean. These are three shades of colour that sit next to each on the colour wheel :). So I had my inked panel ready – I just needed to work out how to use it. I trimmed it down so that it would mat onto an A2 top folding white card base, splattered some water over it and picked it up with a paper towel after a few moments – this breaks the background up a bit. I then added some white gouache splatters for extra interest. 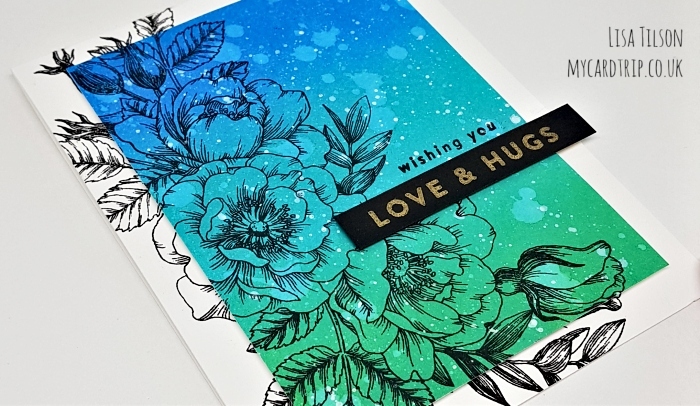 I took my Simon Says Stamp Beautiful Flowers set and stamped the floral image across the base card using Versafine Onyx Black. I left the stamp in the MISTI and then stamped over my inked panel. All I then needed to do was add some foam sheet to the back of the panel and pop it onto the base card. The sentiment was stamped onto some black cardstock, gold embossing powder applied and then heat set. This was then popped up with foam tape (two layers were required on the right hand side so that it would sit flat). Naturally, after I had done all this, I decided to add the smaller sentiment, so needed to put the whole thing back into the MISTI (removing the foam inside the base of the MISTI as it was now a fully loaded and quite dimensional card). Fortunately the sentiment stamped ok – I got let off a little I think! 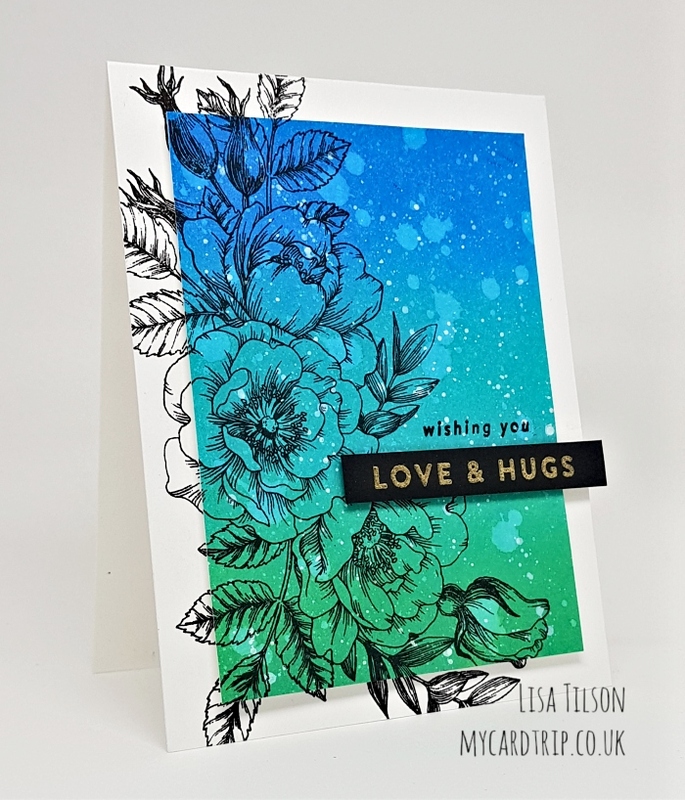 That finishes today’s card and it’s a great opportunity for me to wish you a very happy World Cardmaking Day. I hope you managed to find some time to get inky. I will be back on Wednesday with a project for you featuring a set from the new Simon Says Stamp release. Until then, have a great weekend and thank you for your visit, I really appreciate you taking the time to stop by. Great card, I really like your colours used. I am also taking that class but I am never free at love time so I am playing catch up so no spoiler alerts please ! Question -: which cardstock / paper do you think is best used for zigs & for tombow real brush markers & lastly to learn to blend distress inks on as a starter please ? Having hassles with all three & as you seem to have control of all three mediums. If you have spare time to answer I would be grateful, thank you. Hi Andrea, I use Strathmore Bristol Smooth or Winsor & Newton Extra Smooth Bristol Board for zigs/tombows. Zigs I have had a lot more practice with and would always use a smooth cardstock. Tombows I have less experience of but liked the look on smooth cardstock more than on a watercolour cardstock. Bear in mind that the Bristol cardstock and the Winsor & Newton cardstock are not watercolour cardstocks, so only small amounts of water should be used with them. Thank you Lisa for all that information, it will help loads & be very well appreciated by the local forest that I have got through with my attempts. If ever you come across a company that wants ” here is what not to do ! ” cards please keep me in mind as I have masses ! Lol.